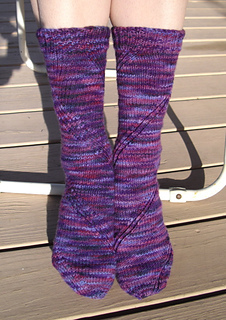 These socks were designed collaboratively with Rachel Shorey in order to display uses of Rachel’s Cool Increase. (A phototutorial for RCI is posted here.) RCI is used structurally in the mathematical heel (you can substitute a different heel if you want) and decoratively in the spiralling motif. 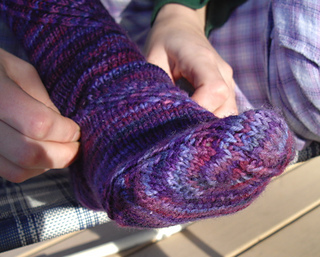 Special thing about the heel: it’s done in the round, not using short rows or flaps. 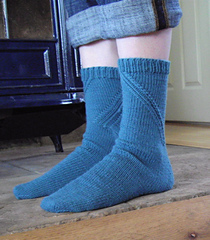 There are two versions of the socks, one with a plain foot and one with the spiralling motif flowing around the foot and across the tip of the toe. 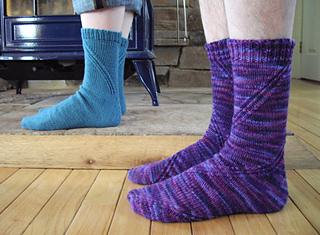 Any springy DK/sport-weight yarn should do. The ﬁnished circumference (unstretched) is 6.9” for a small, 7.5” for a medium, or 8.1” for a large. 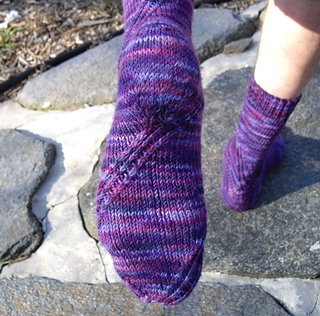 This pattern is not easy to modify for other circumferences, but easy to modify for other foot lengths and calf heights. 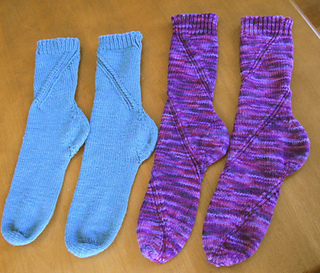 Techniques used: Judy’s Magic Cast On, Jeny’s Super Stretchy Bind Off, Rachel’s Cool Increase, and Reverse Rachel’s Cool Increase. Stitches used: Twisted stitch (aka k tbl), M1, k2tog, ssk.